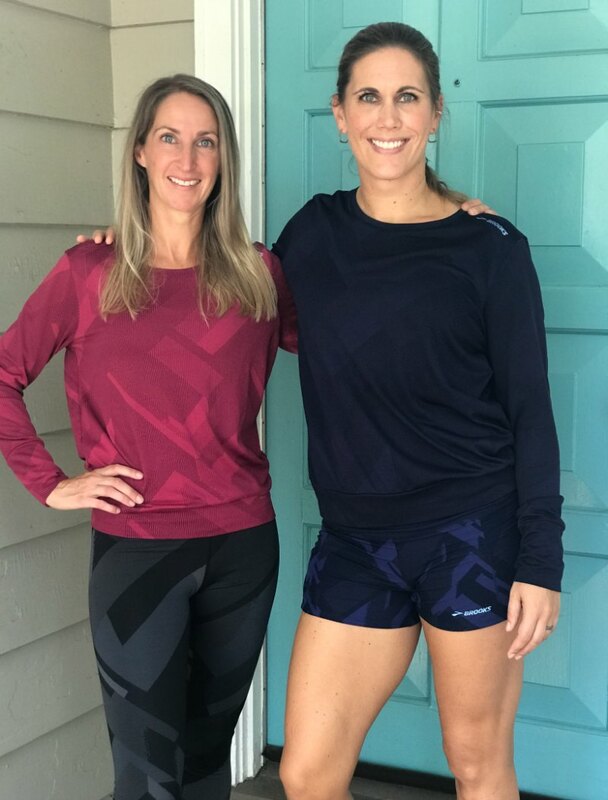 Some things are truly best when shared with someone who means a lot to you, like a good bottle of wine, a tough workout, and awesome new running gear. Except, we don’t want to share our actual running gear, because EWWW SWEAT for one thing, size for another, and sometimes … our running buddy has rather different requirements in gear than we do. Like, Jenn and I need to wear sports bras. Her husband … does not. 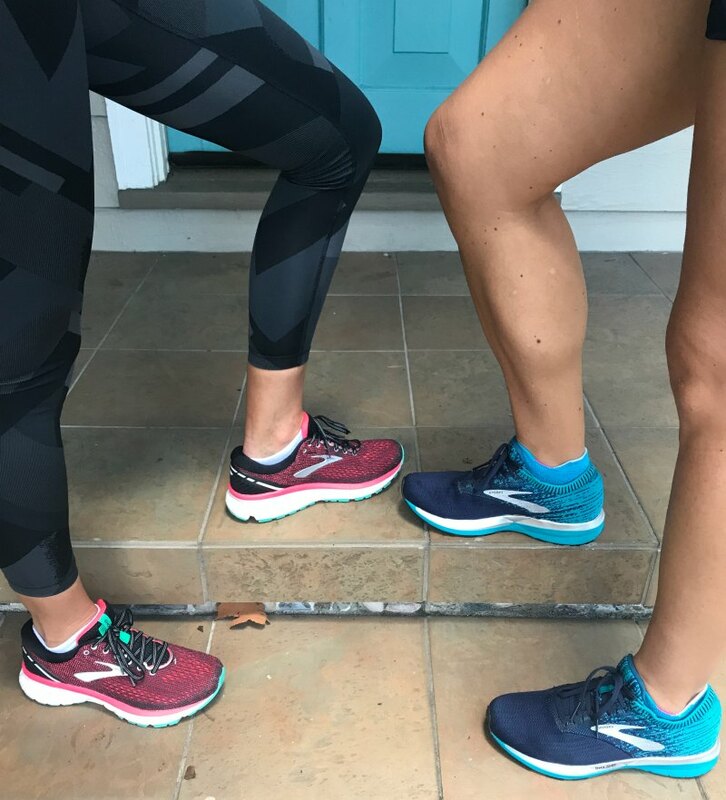 So, the fact that Brooks gave us the chance to check out our pick of goodies from the Fall ’18 catalog — and let us share that perk with a running buddy? 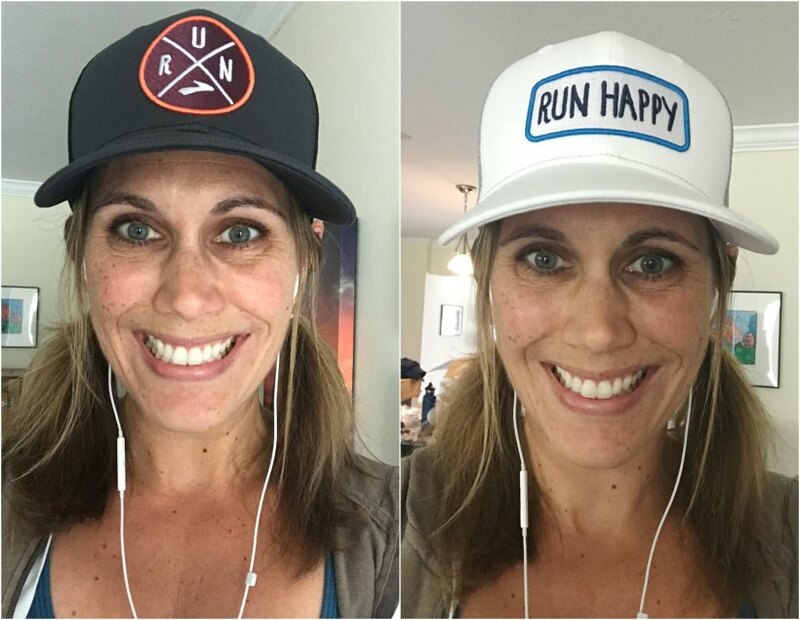 And now, we’re excited to share our reviews — and a few of our thoughts about what makes our running buddies so darn special — with you! I’m fortunate to have several people in my life who inspire me to be active. 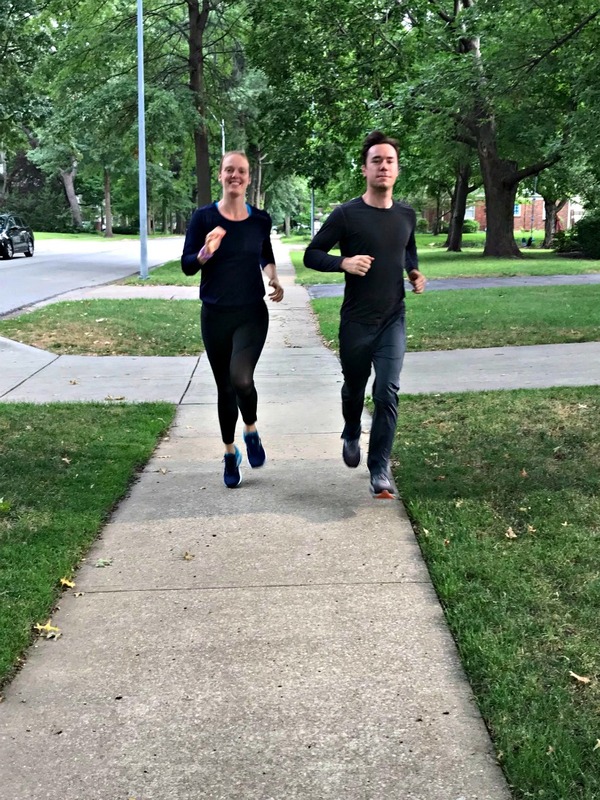 My husband is game to join me in a run more often than not. I have a small group of friends who’ve been coming over weekly to join me for a little at-home boot camp. And, if I’m looking at a destination race, well, I’ve never had trouble finding people to join me. But when it came time to pick the one person who’s been a true run happy inspiration for me lately, it’s my friend Danielle. She’s not only happy to join me for a run — even when I’m injured and doing a lot of walking — but she’s often the one who invites me. That support means a lot, because I know it’s not as much fun to run when I can’t hold our normal pace, but she never, ever makes me feel like I’m holding her back. She’s tougher than she thinks, and is great at keeping the conversation going when we’re a few miles in and I can talk, or I can breathe, but I can’t do both at the same time. Plus, she loves eating really good food every bit as much as I do, so even when we’re both struggling to commit to a run in the unrelenting Florida heat, we can usually get excited about where we can go grab a snack afterward — and sometimes, that’s enough to get us out the door. Plus, when I mentioned a big, scary, maybe slightly stupid running goal that I’m considering (and which I’ll tell you guys more about later), her response wasn’t simply to tell me that it was actually possible — it was to ask how she might be able to be a part of it. So, outfitting her in new Brooks Running gear (top, bottoms, shoes and sports bra) really seems like the least I can do! Truth be told, the person I technically run the most with is my daughter. 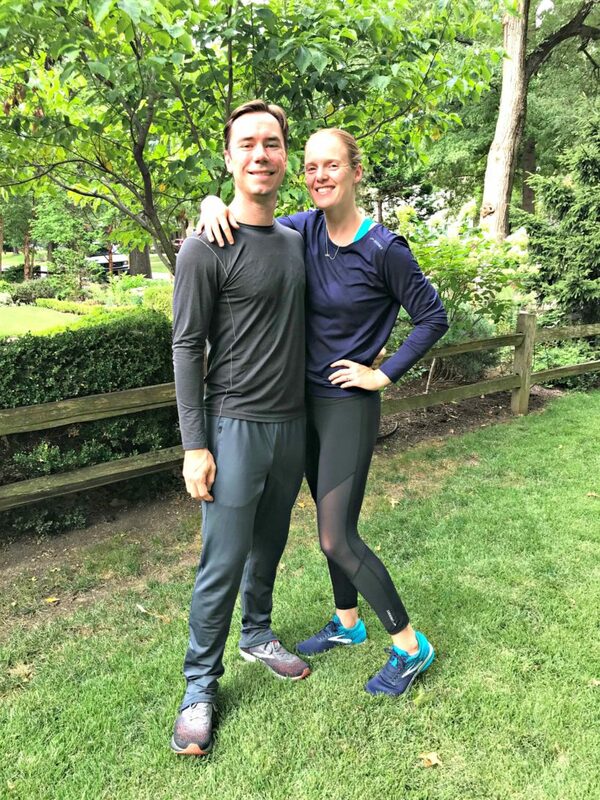 But, since Gwen logs most of her miles sitting in the jogging stroller while eating snacks (she lives the life, yo), I had to pick my husband Ryan as my running buddy. Sure, we have a complicated relationship … in our running relationship (as discussed here) … but, I’m happy to say that we now running together A LOT. Yes, he may be a half a mile in front of me at any given point because his pace is so much faster, but we start together. We do the same route. And we end together. (He will literally run back to where I am and join me at my pace as I finish.) Then we stretch, foam roll, high-five and discuss our run together. It’s a lot of togetherness for spending most of the run not together. And it feels really good and is really fun. We both get to run our own pace with our own tunes, but we’re still out there supporting each other and spending quality time together. Plus, Ryan finds THE BEST running songs (many of which have made our monthly workout playlists). And, as you’ll read in his reviews below, he’s pretty damn funny. So, of course, I wanted to hook him up. Here’s what we got, who’s wearing what — and what we thought about it all. Hot Shot Bra, $38 (Kristen): This is considered a low-impact bra, so truly, I expected it to be just a yoga and comfy lounging option — which would’ve been fine, because it is adorable! 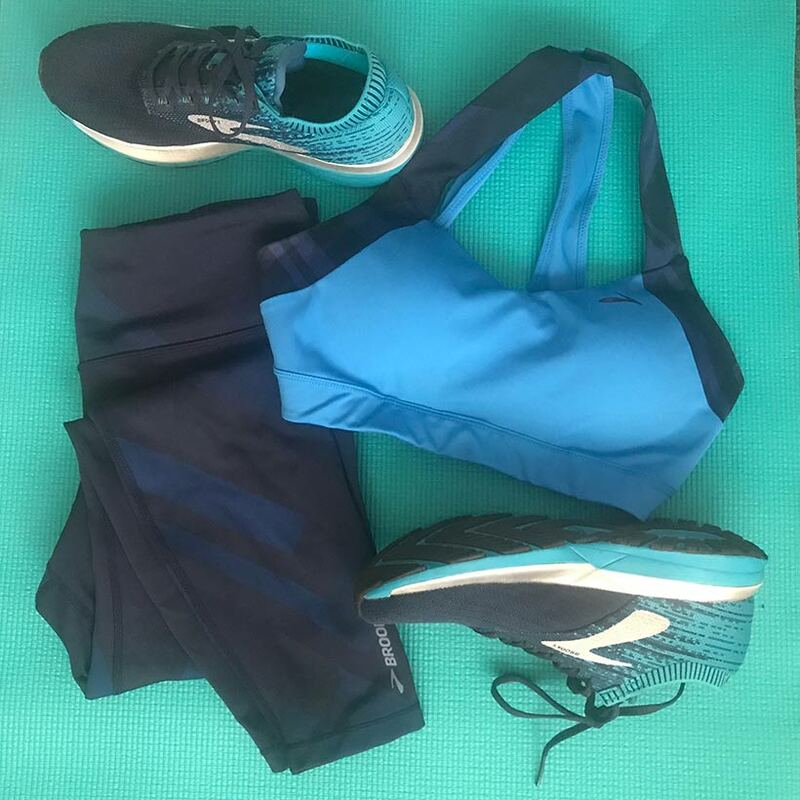 I’m pleased to report that it offers more support than I’d expected, though, so while I’m not planning run for an hour in it, it felt great on a short jog and for a medium-intensity HIIT workout. FineForm Bra, $50 (Danielle): It’s really nice to have the clipping option for the sports bra, so you can have it as a racerback, or not. One small note, though, is that when the back is clipped, it can squeak a little. But it’s cute and comfortable! JustRight Racer, $48 (Jenn): THIS IS MY NEW FAVORITE RUNNING BRA. I don’t mean to shout out, but, I am, because it’s shout-worthy. If you’re looking for a basic medium-impact bra that feels great on (almost like a second skin) this is it. I want 100 of them. UpLift Crossback, $44 (Kristen — pictured above flat): The UpHold is my go-to sports bra for everything, and I tend to pick one up every season because, well, can a girl have too many? What’s extra cool is that Brooks has just now introduced a third addition to this family of bras. Joining the UpRise Crossback for A/B cups and the UpLift for C/D cups is the brand new UpHold for DD/E cups. I’m thrilled to see this, because even though it’s considered medium impact, I’ve found it plenty supportive for literally everything I do — and I want everyone, regardless of breast size, to have the chance to try it out. Ghost Long Sleeve, $50 (Ryan): This is a superhero shirt, plain and simple. The double-seamed arms, tapered fit, and extreme lightness of feel and weight of the fabric combine to give the appearance of a Fantastic Four character out for a run. Just be careful no one learns your identity. Chaser 3″ Short, $46 (Kristen): Yeah, you know our feelings around here on the Chaser short — and those feelings are that these are the best shorts ever. The latest pattern is no different — and I love the way this pattern pairs with several of the bras and tops in this season’s collection! Not to mention how sharp they look with my new kicks. Ghost High-Waist Mesh Crop, $90 (Jenn, shown above): These are a lot like these pants, but with really fun mesh cut-outs that are cool (literally), funky and look oh-so-cool (if I do say so myself). The fabric is light and breathable — a new go-to fave of mine for fall! Spartan Pant, $75 (Ryan. shown above): Many times we are disappointed that the future is not what we hoped it would be. We were promised flying cars and hover-boards by now. The Spartan Pant is like wearing the pants of your great grandchildren — like stepping into the future. Pockets, zippers, tapered fit, versatile for a wide temperature range, simple lines, etc. It feels like someone actually tried to think about what a running/athleisure pant can be instead of just what will sell — and they did it. Ricochet (available 10/1/18 — so stay tuned! ), $120 (Kristen, Jenn): We had pretty different experiences with this brand new neutral shoe, which probably mean’s that Jenn’s advice — try it on! — is sound. Kristen loves the wrap around heel collar, which includes a loop in the front to give you a heel lock experience without having to go through this PITA process. These feature a lightweight frame with energized cushioning, which is designed to provide a light, responsive feel, and that was Kristen’s experience. Jenn, however, found that despite this shoe being cute AF and having a really good energetic feel to them upon footstrike, the heel rubbed her raw on both feet. It’s a problem both of us have run into in the past, so it’s really interesting that we didn’t both experience it here. Bottom line, test them — and if they work for ya, you’re in for a treat! Ghost 11, $120 (Danielle): This was Danielle’s first experience in the Ghost, which she opted for after running for a while in the PureFlow and finding she wanted a little more cushion. Happily, it was love at first run! The Ghost 11 is a neutral shoe that falls in the Cushion family (as opposed to the Energize family, like the Ricochet — this is because they utilize a different type of foam in the sole for a different experience). Levitate 2, $150 (Ryan, shown above): For me, the mad scientists back at lab got this one right. You can feel something in the sole of the shoe. You can see something in the detail of the upper, lace, and ankle. I feel like I am running on fresh legs with these — even when this is not the case. Running in this shoe will make you artificially faster, immediately. It’s up to you if you want that or not.